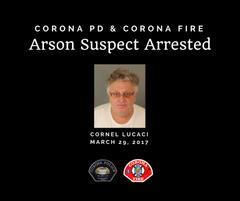 On March 27, 2017, arson suspect Cornel Lucaci was taken into custody by the Riverside County Sheriff’s Office. A lengthy investigation was conducted by the Corona Fire Department, Corona Police Department, and the Riverside County District Attorney’s Office as a result of a two-alarm commercial structure fire that occurred on March 26, 2014. Five Engines, one Truck, 1 Squad, four Chief Officers, the Fire Marshal, two Fire Investigators, and 30 Firefighters responded to the incident. The structure located at 520 E. Parkridge Ave. in Corona sustained extensive damage. The Corona Fire and Police Departments partnered with Riverside County Arson Task Force, ATF, and National Insurance Crime Bureau (NICB) for the three-day long investigation of the fire scene. Lucaci has been arrested on one count of Arson and two counts of Burglary.